Hello! Happy Thursday! Welcome to the June Taylored Expressions Calendar Challenge! Each month, some of the Baker's Dozen will post samples of calendars using various calendar products available at Taylored Expressions! You are also invited to play along with us! This is my first month participating, and I am super excited! 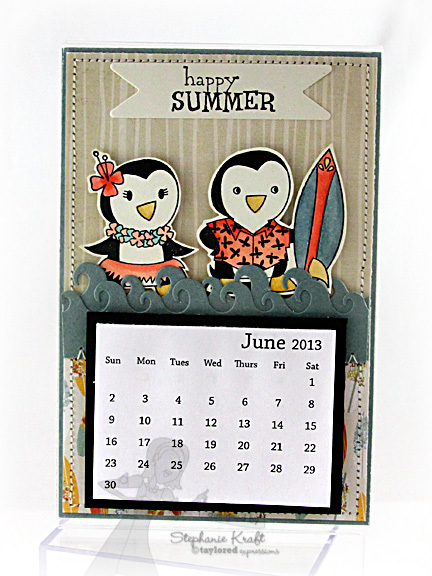 My samples will be using the Desktop Acrylic Calendar Base and Mini Tear-Off Calendar. Please note that the 2012 Tear-Offs are no longer available, but it's never too early to plan ahead for 2013. You can find a single year of Tear-Offs, HERE or save by purchasing a 10-pack, HERE. After all, calendars make GREAT gifts! All TE Calendar products can be found in the store. To give you an idea of the size, my full calendar page measures 4" across and 6" tall. 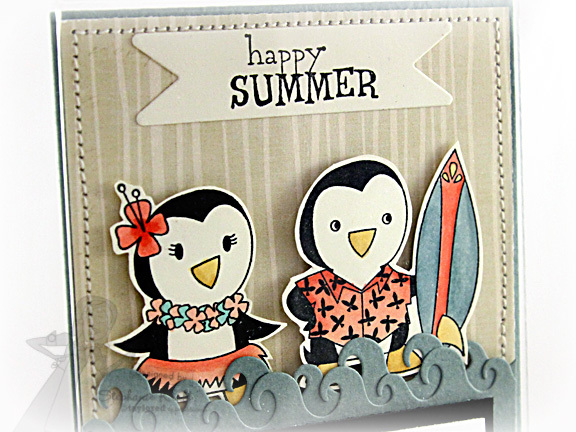 The female penguin is from Beach Belle and her surfing pal is from Surf's Up (both petite sets). I stamped both onto Choice Buttercream cardstock, colored with Copic markers, fussy cut and added to my layout with foam tape. "Happy Summer" is also from Beach Belle. I used the Fly Your Flag 2 Die to cut it out. I used coordinating patterns from the Echo Park Paradise Beach collection. By the way, I was really pleased to find out that I could add some foam tape to my layout as it adds some nice dimension (plus I also added another sheet of cardstock behind my layout to hide my stitching on the back side) AND still slide it comfortably into the acrylic base! 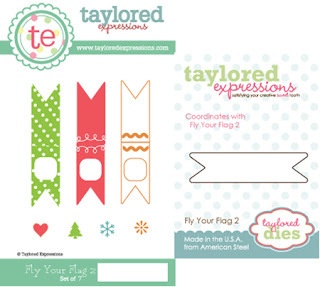 Please check out Taylor's blog for all the details on how to join in! 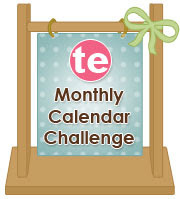 As a special incentive, for everyone who plays in 10 or more of the monthly challenges in 2012, there will be a random drawing for a TE prize pack valued at over $150! Haven't played along yet? No worries - you can jump in any time and catch up on any months that you may have missed! Accessories: Fly Your Flag 2 Die, Wave Border Die, Desktop Acrylic Calendar Base, Mini Tear-Off Calendar (Taylored Expressions); Markers (Copic), Foam tape, Thread, Sewing machine. I love this! What a cute little beach couple and your layered waves are perfection! Happy Summer! This is really cute! I love the waves. Great job! How cute!! Love the layered waves. Super cute and so summery!! So adorable Stephanie! You did an amazing job coloring all the detail in those cute penquins! Happy Summer to you! OMG this is sooo darn cute!!! Great work! !